Source: Italy, Chile and the United States. Handling Tips: 34°F. Keep cold, mist lightly. 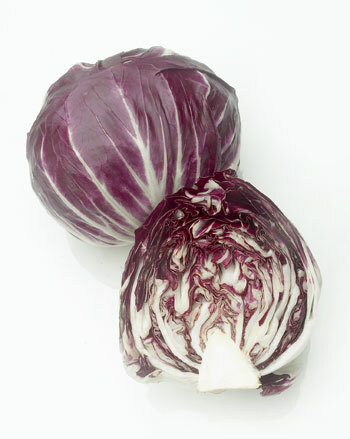 General Information: Radicchio Rosso di Chioggia was bred from the Variegato; it has dark red leaves with white ribs, but is rounder than Radicchio di Treviso; it's also compact, and as a result it resembles a head of cabbage in shape. It's now the most commonly grown radicchio rosso in Italy. Prized for its ruby red color and pungent flavor, the head size may range from baseball to softball size. Radicchio has a sharp, intense flavor that is pleasantly bitter. It has tender but firm leaves and is a popular green in salad mixes. Commonly, the name �radicchio� refers to the variety with dark maroon leaves and white ribs growing in a round head about the size of a large grapefruit. Heads are tightly packed layers of tender, thin leaves. Superb fresh in salads or grilled and sprinkled lightly with olive oil. Excellent source of vitamins A and C.
Applications: Radicchio can be used raw in salads, as an ingredient in a variety of cooked dishes such as pasta or pizza and it is especially well suited for grilling. You can control the intensity of its flavor by soaking the leaves before you use them.